Selecting the right linens for your wedding is a huge, sometimes stressful thing! What size do you need? What color will hi-light your wedding theme and colors? How many linens do you need? Do you need lap length or to the floor? What do you do for your head table? Do you need linens for buffet tables? Do you need linens for gift tables, seating charts, cake table, etc.? Wow….where do you begin! So just imagine……You walk into your venue room. All the tables have been set according to the floor plan – lots of round tables for your guests, rectangle tables in the middle of the room pushed together for your king’s head table, a small round table at the front of the room for your cake, and other rectangle tables scattered around the room for gifts, beverage tables, place cards, etc. But all the tables are bare – no linens. Wow….it looks plain, empty, and overwhelming! It is the typical scene of a wedding. The natural beauty starts to develop as the freshly ironed linens are placed on the tables. Imagine a crisp white tablecloth to the floor. 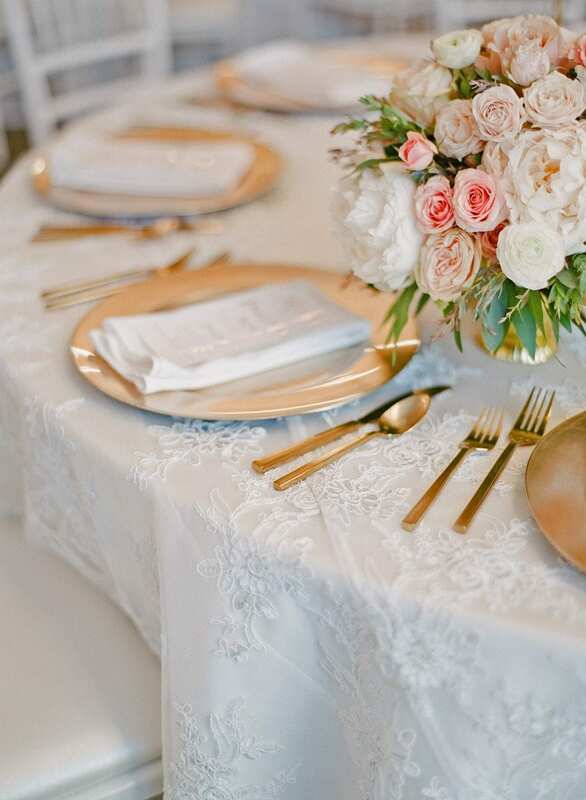 Then an elegant white floral lace table overlay atop the tablecloth. The next layer of accent is a glass hammered gold rim charger plate with a sharp white salad plate placed on top. A top the white plate is an elegantly folded white hemmed stitched napkin. And matte gold flatware is added to complete the table setting. Add elegant flowers, accented with white and gold votives, along with a bright gold table number stand to mark your table…and you have just created an intimate and extravagant wedding tablescaping of your dreams. This all sounds too easy and simple, but actually the planning of creating a vibrant wedding reception can be a long stressful planning process. But it doesn’t have to be. Event coordinators and event rental businesses, like ourselves, Beyond Elegance, help brides plan their perfect events day in and day out, At Beyond Elegance, we offer FREE consultation services in selecting your linens and decor for your wedding….as an added bonus for renting from us. You don’t want to walk into your wedding reception and be surprised or disappointed in your table decor. That is why at Beyond Elegance we encourage our local brides to come visit our showroom and actually dress a table with the linens and decor of their choice so they can physically see the table prior to their event. For our out-of-state brides, we offer to ship color sample fabric swatches (normally a napkin in their linen color) so they can view and approve before officially placing their order. Far too often we receive fretful calls from brides or mothers-of-brides who have purchased their linens on line asking if we would iron them for them. And, of course, our answer is “I’m sorry, but we only iron what we rent.” What they have found is that the cheap thread count in the cheap linen is just that! You can spend hours trying to iron or steam the linen which comes tightly folded in a plastic bag and has numerous wrinkles. Try washing it and putting it in the dryer only to find it is more wrinkled than when it went in. Or it has been cut against the grain of the fabric and there is no way to iron it to straighten it out! While event rental linens might cost a little more, you won’t have the stress of ironing them when renting from Beyond Elegance. Nor will you have to launder them which can be a real hassle to get event stains removed from the linens. And then there is the question, where do you store them, and in what? Plus reselling may or may not be fruitful. At Beyond Elegance, we will provide you a high quality product with no rips or stains that are sure to impress your guests and friends. We will professionally iron the linens for you. We will take care of laundering the linens after the event in our commercial washers with Ecolab laundry detergents specialized in removing those tough stains. And you won’t have to worry about storing or the stress of trying to resale. Why not give us a try. Call today to get a rental quote.